If you need to make a cake but are squeezed for time, count on this recipe for a fast solution. Adapted from Charlene Wahlenmaier's recipe posted in the Taste of Home along with the photo. 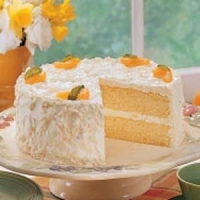 1 package ( 18 ¼ -oz ) white cake. Pour into two greased and floured 9-inch round baking pans. Bake at 325 for 30 minutes or until a toothpick inserted near the center comes out clean. Cool in pans for 10 minutes before removing to wire racks to cool completely. Another high 5 for you!! you are on a roll!! VERY YUMMY!!! HIGH FIVE!!!! How r u? fine I hope!! Like abbott41's recipes? Never miss an upload!